Sacrifice is the offering of food, objects or the lives of animals to a higher purpose, in particular divine beings, as an act of propitiation or worship. While sacrifice often implies ritual killing, the term offering (Latin oblatio) can be used for bloodless sacrifices of cereal food or artifacts. For offerings of liquids (beverages) by pouring, the term libation is used. The Latin term sacrificium (a sacrifice) derived from Latin sacrificus (performing priestly functions or sacrifices), which combined the concepts sacra (sacred things) and facere (to do or perform). The Latin word sacrificium came to apply to the Christian eucharist in particular, sometimes named a "bloodless sacrifice" to distinguish it from blood sacrifices. In individual non-Christian ethnic religions, terms translated as "sacrifice" include the Indic yajna, the Greek thusia, the Germanic blōtan, the Semitic qorban/qurban, Slavic żertwa, etc. The term sacrifice also occurs metaphorically to label selfless good deeds for others or a short-term loss in return for a greater power gain, such as in a game of chess. Recently it has also come into use as meaning "doing without something" or "giving something up" (see also self-sacrifice). 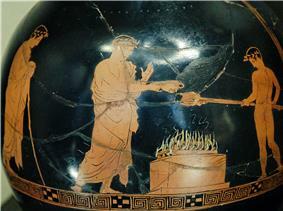 Animal sacrifice offered together with libation in Ancient Greece. Attic red-figure oinochoe, ca. 430–425 BC (Louvre). Animal sacrifice is the ritual killing of an animal as part of a religion. It is practiced by adherents of many religions as a means of appeasing a god or gods or changing the course of nature. It also served a social or economic function in those cultures where the edible portions of the animal were distributed among those attending the sacrifice for consumption. Animal sacrifice has turned up in almost all cultures, from the Hebrews to the Greeks and Romans (particularly the purifying ceremony Lustratio), Ancient Egyptians (for example in the cult of Apis) and from the Aztecs to the Yoruba. It is against their religion for Egyptians to sacrifice animals, except for sheep, bulls, calves, male calves and geese. Animal sacrifice is still practiced today by the followers of Santería and other lineages of Orisa as a means of curing the sick and giving thanks to the Orisa (gods). However in Santeria, such animal offerings constitute an extremely small portion of what are termed ebos—ritual activities that include offerings, prayer and deeds. Christians from some villages in Greece also sacrifice animals to Orthodox saints in a practice known as kourbània. The practice, while publicly condemned, is often tolerated. According to Walter Burkert, a scholar of sacrifice, Greek sacrifices derived from hunting practices. Hunters, feeling guilty for having killed another living being so they could eat and survive, tried to repudiate their responsibility in these rituals. The primary evidence used to suggest this theory is the Dipolieia, which is an Athenian festival, in limited circulation, during which an ox was sacrificed. The protagonist of the ritual was a plough ox, which it had, at one point, been a crime to kill in Athens. According to his theory, the killer of the ox eased his conscience by suggesting that everybody should participate in the killing of the sacrificial victim. In the expansion of the Athenian state, numerous oxen were needed to feed the people at the banquets and were accompanied by state festivals. The hecatomb (“hundred oxen”) became the general designation for the great sacrifices offered by the state. These sacrificial processions of hundreds of oxen remove the original ties, which the farmers of an earlier and smaller Athens will have felt with their one ox. 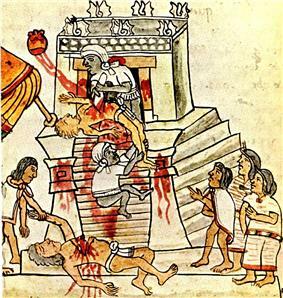 Aztec human sacrifice, from Codex Mendoza, 16th century (Bodleian Library, Oxford). Human sacrifice was practiced by many ancient cultures. People would be ritually killed in a manner that was supposed to please or appease a god or spirit. Human sacrifice to accompany the dedication of a new temple or bridge. Sacrifice of people upon the death of a king, high priest or great leader; the sacrificed were supposed to serve or accompany the deceased leader in the next life. Human sacrifice in times of natural disaster. Droughts, earthquakes, volcanic eruptions, etc. were seen as a sign of anger or displeasure by deities, and sacrifices were supposed to lessen the divine ire. Human sacrifices were practiced by various Pre-Columbian civilizations of Mesoamerica. The Aztec practiced human sacrifice on an unusually large scale; a sacrifice would be made every day to aid the sun in rising, the dedication of the great temple at Tenochtitlán was reportedly marked with the sacrificing of thousands, and there are multiple accounts of captured Conquistadores being sacrificed during the wars of the Spanish conquest of Mexico. In Scandinavia, the old Scandinavian religion contained human sacrifice, and both the Norse sagas and German historians relate of this, see e.g. Temple at Uppsala and Blót. There is evidence to suggest Pre-Hellenic Minoan cultures practiced human sacrifice. Sacrificed corpses were found at a number of sites in the citadel of Knossos in Crete. The north house at Knossos contained the bones of children who appeared to have been butchered. It is possible they may have been for human consumption as was the tradition with sacrificial offerings made in Pre-Hellenic Civilization. The myth of Theseus and the Minotaur (set in the labyrinth at Knossos) provides evidence that human sacrifice was commonplace. In the myth, we are told that Athens sent seven young men and seven young women to Crete as human sacrifices to the Minotaur. This ties up well with the archaeological evidence that most sacrifices were of young adults or children. The Phoenicians of Carthage were reputed to practise child sacrifice, and though the scale of sacrifices may have been exaggerated by ancient authors for political or religious reasons, there is archaeological evidence of large numbers of children's skeletons buried in association with sacrificial animals. Plutarch (ca. 46–120 AD) mentions the practice, as do Tertullian, Orosius, Diodorus Siculus and Philo. They describe children being roasted to death while still conscious on a heated bronze idol. Human sacrifice still happens today as an underground practice in some traditional religions, for example in muti killings. Human sacrifice is no longer officially condoned in any country, and these cases are regarded as murder. In the Aeneid by Virgil, the character Sinon claims (falsely) that he was going to be a human sacrifice to Poseidon to calm the seas. Ritual sacrifice was practiced in Ancient Israel, with the opening chapters of the book Leviticus detailing the exact method of bringing sacrifices. Sacrifices were either blood sacrifices (animals) or bloodless offerings (grain and wine). Blood sacrifices were divided into the burnt offerings (Hebrew: עלה קרבנות) in which the whole animal was burnt, guilt offerings (in which part was burnt and part left for the priest) and peace offerings (in which similarly only part of the animal was burnt and the rest eaten in ritually pure conditions). The prophets point out that prayer and sacrifices are only a part of serving God and need to be accompanied by inner morality and goodness. In contrast, many others such as Nachmanides (in his Torah commentary on Leviticus 1:9) disagreed, contending that sacrifices are an ideal in Judaism, completely central. The teachings of the Torah and Tanakh reveal the Israelites's familiarity with human sacrifices, as exemplified by the near-sacrifice of Isaac by his father Abraham (Genesis 22:1-24) and some believe, the actual sacrifice of Jephthah's daughter (Judges 11:31-40), while many believe that Jephthah's daughter was committed for life in service equivalent to a nunnery of the day, as indicated by her lament over her "weep for my virginity" and never having known a man (v37). 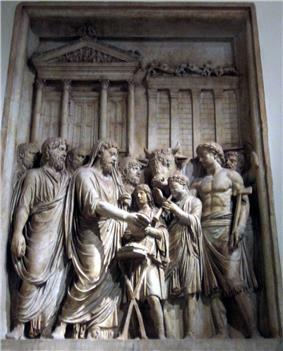 The king of Moab gives his firstborn son and heir as a whole burnt offering (olah, as used of the Temple sacrifice). It is apparently effective, as his enemy is promptly repelled by a 'great wrath' (2 Kings 3:27). In the book of Micah, one asks, 'Shall I give my firstborn for my sin, the fruit of my body for the sin of my soul?' (Micah 6:7), and receives a response, 'It hath been told thee, O man, what is good, and what the LORD doth require of thee: only to do justly, and to love mercy, and to walk humbly with thy God.' (Micah 6:8) Abhorrence of the practice of child sacrifice is emphasized by Jeremiah. See Jeremiah 7:30-32. In Trinitarian Christianity, God became incarnate as Jesus, sacrificing his son to accomplish the reconciliation of God and humanity, which had separated itself from God through sin (see the concept of original sin). According to a view that has featured prominently in Western theology since early in the 2nd millennium, God's justice required an atonement for sin from humanity if human beings were to be restored to their place in creation and saved from damnation. However, God knew limited human beings could not make sufficient atonement, for humanity's offense to God was infinite, so God created a covenant with Abraham, which he fulfilled when he sent his only Son to become the sacrifice for the broken covenant. In Christian theology, this sacrifice replaced the insufficient animal sacrifice of the Old Covenant; Christ the "Lamb of God" replaced the lambs' sacrifice of the ancient Korban Todah (the Rite of Thanksgiving), chief of which is the Passover in the Mosaic law. In the Melchizedek in sacrifice in the old covenant (Genesis 14:18; Psalm 110:4), are transformed through the Mass into the body and blood of Christ (see transubstantiation; note: the Orthodox Church does not hold as dogma, as do Catholics, the doctrine of transubstantiation, preferring rather to not make an assertion regarding the "how" of the sacraments), and the offering becomes one with that of Christ on the cross. In the Mass as on the cross, Christ is both priest (offering the sacrifice) and victim (the sacrifice he offers is himself), though in the Mass in the former capacity he works through a solely human priest who is joined to him through the sacrament of Holy Orders and thus shares in Christ's priesthood as do all who are baptized into the death and resurrection of Jesus, the Christ. Through the Mass, the merits of the one sacrifice of the cross can be applied to the redemption of those present, to their specific intentions and prayers, and to the release of the souls from purgatory. "In the Cross of Christ not only is the Redemption accomplished through suffering, but also human suffering itself has been redeemed...Every man has his own share in the Redemption. Each one is also called to share in that suffering through which the Redemption was accomplished...In bringing about the Redemption through suffering, Christ has also raised human suffering to the level of the Redemption. Thus each man, in his suffering, can also become a sharer in the redemptive suffering of Christ...The sufferings of Christ created the good of the world's redemption. This good in itself is inexhaustible and infinite. No man can add anything to it. But at the same time, in the mystery of the Church as his Body, Christ has in a sense opened his own redemptive suffering to all human suffering" (Salvifici Doloris 19; 24). Some Protestants reject the idea of the Eucharist as a sacrifice, inclining to see it as merely a holy meal (even if they believe in a form of the real presence of Christ in the bread and wine, as Lutherans do). The more recent the origin of a particular tradition, the less emphasis is placed on the sacrificial nature of the Eucharist. The Catholic/Orthodox response is that the sacrifice of the Mass in the New Covenant is that one sacrifice for sins on the cross which transcends time offered in an unbloody manner, as discussed above, and that Christ is the real priest at every Mass working through mere human beings to whom he has granted the grace of a share in his priesthood. As priest carries connotations of "one who offers sacrifice", Protestants usually do not use it for their clergy. Evangelical Protestantism emphasizes the importance of a decision to accept Christ's sacrifice on the Cross consciously and personally as atonement for one's individual sins if one is to be saved—this is known as "accepting Christ as one's personal Lord and Savior". The Orthodox Church sees the celebration of the Eucharist as a continuation, rather than a reenactment, of the Last Supper, as Fr. John Matusiak (of the OCA) says: "The Liturgy is not so much a reenactment of the Mystical Supper or these events as it is a continuation of these events, which are beyond time and space. Unlike many of the Protestant bodies, the Orthodox also see the Eucharistic Liturgy as a bloodless sacrifice, during which the bread and wine we offer to God become the Body and Blood of Jesus Christ through the descent and operation of the Holy Spirit, Who effects the change." This view is witnessed to by the prayers of the Divine Liturgy of St. John Chrysostom, when the priest says: "Accept, O God, our supplications, make us to be worthy to offer unto thee supplications and prayers and bloodless sacrifices for all thy people," and "Remembering this saving commandment and all those things which came to pass for us: the cross, the grave, the resurrection on the third day, the ascension into heaven, the sitting down at the right hand, the second and glorious coming again, Thine own of Thine own we offer unto Thee on behalf of all and for all," and "… Thou didst become man and didst take the name of our High Priest, and deliver unto us the priestly rite of this liturgical and bloodless sacrifice…"
An animal sacrifice in Arabic is called ḏabiḥa (ذَبِيْحَة) or Qurban (قُرْبَان) . The term may have roots from the Jewish term Korban; in some places such as in Pakistan, qurbani is always used for Islamic animal sacrifice. In the Islamic context, an animal sacrifice referred to as ḏabiḥa (ذَبِيْحَة) meaning "sacrifice as a ritual" is offered only in Eid ul-Adha. The sacrificial animal may be a sheep, a goat, a camel, or a cow. The animal must be healthy and conscious. ..."Therefore to the Lord turn in Prayer and Sacrifice. " (Surat Al-Kawthar) Quran, 108.2 Qurban is an Islamic prescription for the affluent to share their good fortune with the needy in the community. On the occasion of Eid ul Adha (Festival of Sacrifice), affluent Muslims all over the world perform the Sunnah of Prophet Ibrahim (Abraham) by sacrificing a cow or sheep. The meat is then divided into three equal parts. One part is retained by the person who performs the sacrifice. The second is given to his relatives. The third part is distributed to the poor. The Qur'an states that the sacrifice has nothing to do with the blood and gore (Qur'an 22:37: "It is not their meat nor their blood that reaches God. It is your piety that reaches Him..."). Rather, it is done to help the poor and in remembrance of Abraham's willingness to sacrifice his son Ishmael at God's command. The Urdu and Persian word "Qurbani" comes from the Arabic word 'Qurban'. It suggests that associate act performed to hunt distance to Almighty God and to hunt His sensible pleasure. Originally, the word 'Qurban' enclosed all acts of charity as a result of the aim of charity is nothing however to hunt Allah's pleasure. But, in precise non secular nomenclature, the word was later confined to the sacrifice of associate animal slaughtered for the sake of God. A similar symbology, which is a reflection of Abraham and Ismael's dilemma, is the stoning of the Jamaraat which takes place during the pilgrimage. The Sanskrit Yagya is often translated as "sacrifice" (also "offering, oblation", or more generically as "worship"). It is especially used to describe the offering of ghee (clarified butter), grains, spices, and wood into a fire along with the chanting of sacred mantras. The fire represents Agni, the divine messenger who carries offerings to the Devas. The offerings can represent devotion, aspiration, and seeds of past karma. In Vedic times, Yagya commonly included the sacrifice of milk, ghee, curd, grains, and the soma plant—animal offerings were less common. In modern times, Yagya is often performed at weddings and funerals, and in personal worship. Sacrifice in Hinduism can also refer to personal surrender through acts of inner and outer worship. ^ "act of worship or devotion, offering, oblation, sacrifice (the former meanings prevailing in Veda, the latter in post-Vedic literature", Monier-Williams. ^ "Indeed the offering of milk into the fire was more common than animal offerings." p. 359.